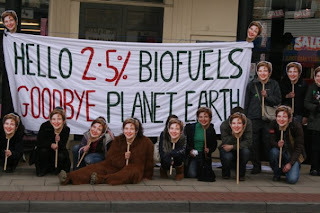 Green in Manchester - Vanessa Hall: No bad biofuels please! There is a proven direct link between biofuels and climate change, deforestation and the degradation of local communities and bio-diversity and world hunger; the ‘Renewable Transport Fuels Obligation’ which comes into force from the 15th April will only fuel these problems as there is no safeguard ensuring that the biofuels you and i will be putting in our tanks from the 15th come form a sustainable source. We're demanding that Transport Minister Ruth Kelly tells the bureaucrats in Brussels that the UK is withdrawing from the directive until a biofuel sustainability certification is put in place."